We are bombarded with negative stories and depictions of pregnancy and birth, from the chaotic births you see on the ever-popular TV series One Born Every Minute to the birth stories (well-intentioned) strangers tell you on the bus. At some point in your pregnancy journey, it might be worth setting boundaries and limiting the negative input around birth. Why? One theory in HypnoBirthing is that when you reduce the negative thoughts and emotions around birth you can open space in the mind for positive thoughts to grow. As they start to grow, the negativity naturally subsides. A little like weighing scales–you want them to tip in your favour! 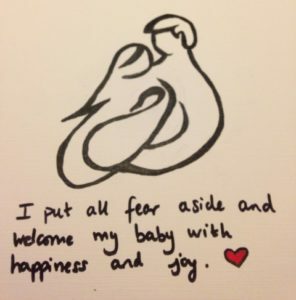 Would you rather feel fearful and anxious about birth, or excited to meet your baby? Politely duck out of any conversation where birth is being pictured in a negative way ‘I need the toilet’ or even more directly ‘I am trying to focus on positive birth stories at the moment, let’s talk more after I’ve had my baby’. Avoid watching anything that depicts birth as anything other than the positive, natural and healthy experience that it is. This rules out the aforementioned One Born Every Minute TV series and potentially Call the Midwife (though this one depends on which episode you’re watching). Instead, read books that will empower you and make you think about how birth can be. Search on YouTube for ‘hypnobirths’ or even ‘orgasmic births’. If you attend a Positive Birth Movement meeting (where new mums talk about their births in a positive light), you will have the added benefit of being surrounded by birth professionals who have seen birth in a beautiful light. Read positive birth stories like those in Spiritual Midwifery by Ina May Gaskin. Choose your antenatal and birth preparation courses wisely. Remember: What you think is what you become. For example, if you over-focus on a ventouse delivery or even a c-section, that may end up being the fate of your birth. It is, of course, not that black and white; however, you can give yourself your best chance of having the kind of birth you want if you think about it, visualise it, draw it, dream it, talk about it. We suggest writing these down and putting them in places where you see them regularly, e.g. on the mirror where you brush your teeth, by the kettle. Are you able to make some small changes NOW to limit the negativity you see or hear around birth? How can you create some healthy boundaries with well-intentioned friends and strangers to opt out of unhelpful conversations? Are you willing to try using affirmations to help you to focus on the exciting event that birth is? For more information, see our page on what HypnoBirthing can teach you. For a free PDF copy of the Birth Affirmations please email us at info@purelypregnant.co.uk. Did you find this helpful? Please let me know in the comments below and please share with anyone who might be interested.